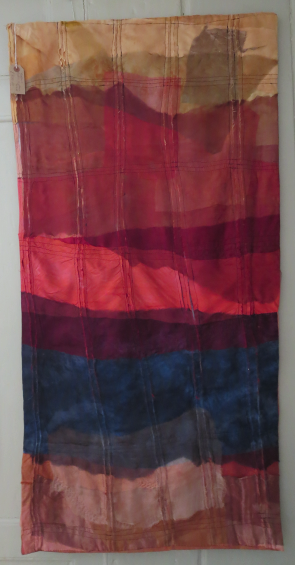 The textiles below are currently being exhibited upstairs in an exhibition at Trattles and Geall Fine Arts, Church Street, Whitby. Chinese painters were deeply influence by Buddhism and it was this philosophy which gave them a new way of looking at pictures, They began to see the artist as an inspired poet who meditated on nature or water and painted images with a sense of reverence, to provide material for deep thought. What the viewer took away from the picture was a sense of awe at the artists vision and not the realistic detail of a recognisable place on the ground. As you look at these pieces I hope you will make your own impression, one that is personal to you. Each one is individual, unusual and totally unique and it will be your own recollections and feelings which may be sparked off by a colour or a particular shape, quite possibly different from my original intention. This is absolutely fine. Just let the pieces wash over you and become aware of your response. I find a sense of place in the landscape fascinating By focusing on a particular feature in the landscape, in this case an old disused mill in Leek, I engage with it, draw and photograph it and soak up the atmosphere in a deep way.This gives me the colours and images which I want to develop. Print, stitch and collage are then used to create an impression. It was the regimented rows of mill windows which caught my imagination. The building was boarded up with huge pink fluorescent pink covers over the panes of glass and there were amazing reflections and views through several layers of windows, a relief from the severity of the building. 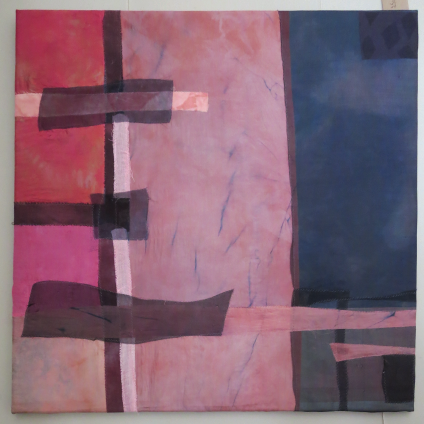 I love colour and shape and was inspired by Rothko and the Amish Quilts from the USA. 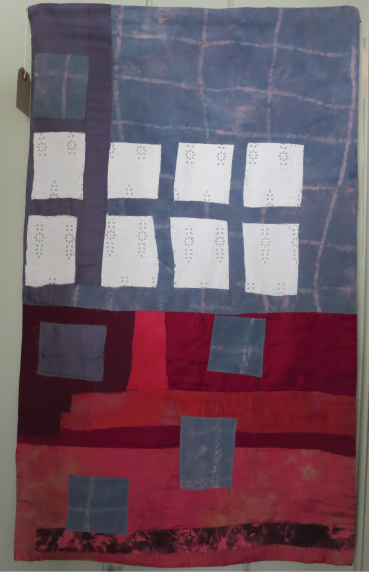 I also like Helen Parrott's work in which stitch is used as a design element. One of the best exhibitions I saw was several years ago at the Whitworth Art Gallery, Manchester and was called 'Textural Space'. 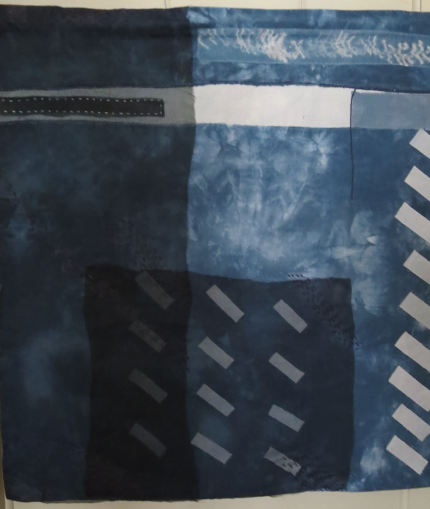 It was outstanding for its use of textiles and paper to convey the abstract qualities of air, wind and water. 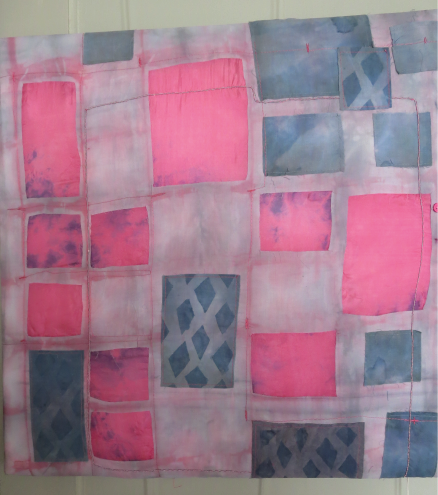 My own textile practice sits on the edge between textiles and fine art. 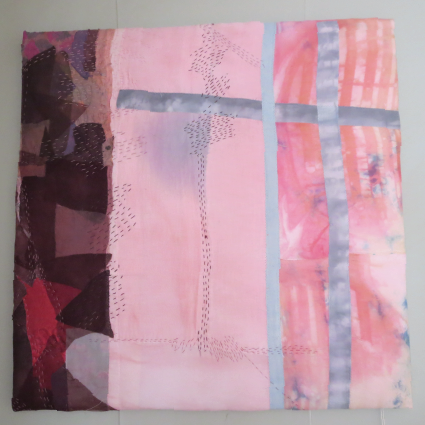 Textile Art is about so much more than sewing. It can be about ideas and conveying impressions and uses embroidery techniques in a contemporary way. 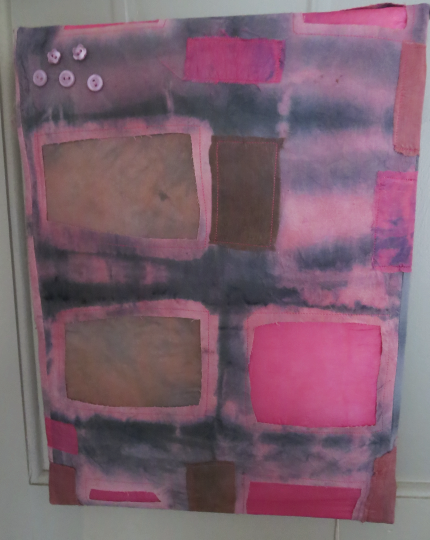 My pieces are more like intuitive paintings with fabric, dyes and threads. They develop organically with limited forward planning. 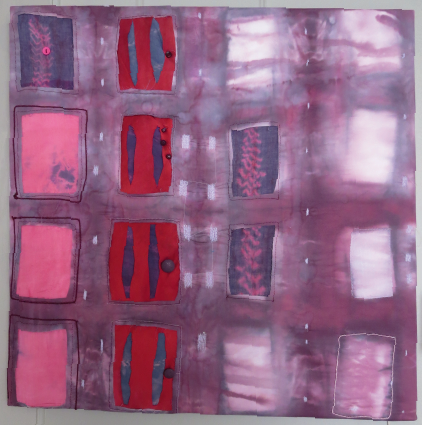 I have made textile art for many years now and sold widely in both the UK and abroad. My work has been exhibited in gallery settings and in many other places not normally associated with art.